This is essentially the area between Bromley North (Picture) and Bromley South (Picture) railway stations but also includes surrounding "villages" like Sundridge Park, Shortlands and Widmore. For a map of Bromley, or in fact anywhere in the country, a very useful facility is provided by Multi Media Mapping. If you don't know a local postcode, start with "BR1". Bromley is a major, if declining, shopping centre with the principal shops including BHS, Boots, Marks & Spencer, Debenhams, Primark etc. 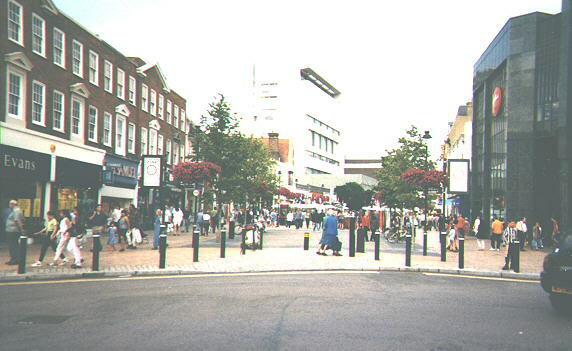 plus all too many of the usual high street names, either in the quite attractive Glades Shopping Centre or the largely pedestrianised High Street (Picture). Through traffic has been diverted via Kentish Way (Picture) for some years. Unfortunately this also provides access to two large car parks and, as usual, the planners didn't quite get their traffic flows right. Probably more unintentional parking takes place in Kentish Way than anywhere else and to ensure we don't all choke to death while waiting, "they" have installed some Air Quality monitoring equipment near the former police station to make sure. 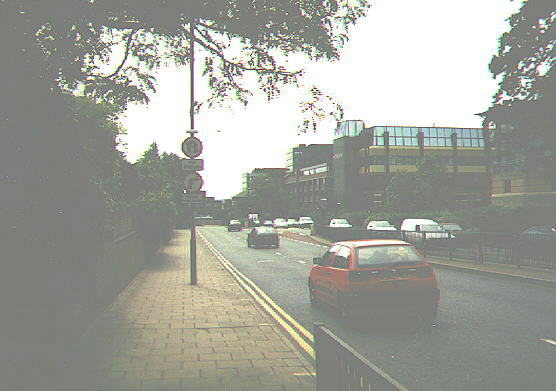 The new Police Station has now opened near Bromley South station where, incidentally, the mad traffic planners have been at work again to make impossible for any vehicle to come near the station - See picture and exciting competition! Next to the Glades is the Pavillion Leisure Centre (Picture) which has a swimming pool, squash courts and fitness areas. There is one cinema, the four-screen Empire (until recently Odeon) at the top of the High Street but it is getting a bit shabby. You should be able to find out what's on here. 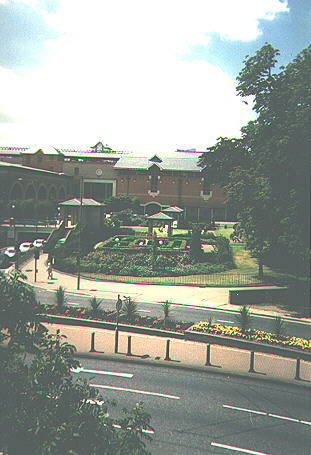 Live entertainment is provided by the Churchill Theatre (named after Sir Winston who used to pass through here on his way to Biggin Hill and his home at Chartwell) The theatre is located behind the library visible in the centre of this picture. For a different perspective on Bromley and its charms, try this irreverent view of what makes life worth living (for some) in this neck of the woods . No doubt the skateboarders are licking their lips over the new pedestrian desert installed in front of Bromley South station. For those of you not yet near retirement age (whenever that is these days), a visit to this newer and genuinely local blog site site might be worth a few minutes of your time. 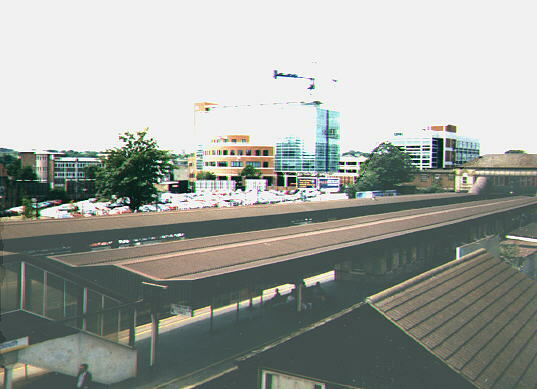 Bromley is served by main line railway services from Bromley South from where fast trains to London take about 15 minutes to Victoria or (occasionally) 22 minutes to Blackfriars. In the other direction, there are direct trains to Ashford, Chatham, Dover, Maidstone, Orpington, Ramsgate, Swanley and Sevenoaks. Bromley North is restricted to a shuttle train service to Grove Park, calling at Sundridge Park, from where there are connections to London (Cannon Street, Charing Cross, London Bridge and Waterloo), as well as Lewisham (where you can change to the Docklands Light Railway, or DLR) and New Cross, the nearest London Underground link (East London Line). There are no Underground stations in the Borough. For details of train times to and from Bromley, use the National Rail enquiry system. 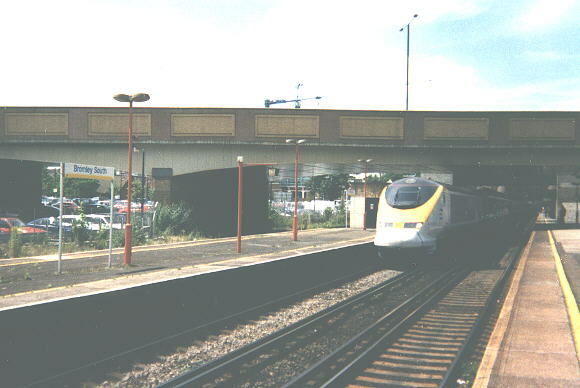 Also running through Bromley South for the moment, but not stopping, are the Eurostar express services (Picture) between London Waterloo and Paris and Brussels via the Channel Tunnel. Some of these services also call at Ashford International. A more recent and useful development in the transport field is the Tramlink which runs from Wimbledon in the west to Beckenham Junction and Elmers End in the east, but still some way from Bromley centre. For aficiandos, a more lively view about this service can be found at the unofficial Tramlink site! Lots of buses, painted various colours of the rainbow (sometimes many on a single vehicle!) but nearly all operated under the London Transport banner run into or through the town centre. Since privatisation, they apparently run to more places via more back streets but, outside of rush hours, are still pretty lightly used. To find out more, go to Transport for London's Bus Services pages. If you have wider travel needs, you could also try UK Public Transport Information which covers a lot of other areas. If public transport isn't your thing, you will need a car. The best place to find a vehicle which suits your individual personality can be found at Peter Byrne - you will need a substantial bank balance though and, just a warning, you will still get stuck in traffic like everyone else in Bromley! To fly anywhere from Bromley you usually need to travel to Gatwick or Heathrow. Gatwick is about 45 minutes to the south (M25 and M23 permitting) while Heathrow is about 90 minutes to the west (M25, M4 and London traffic generally permitting). To get to these airports by train, you need to travel via London Victoria, changing either to the Gatwick Express or the District and Piccadilly Underground lines respectively. Biggin Hill Airport offers a very limited public service being mainly used for private flying and the occasional Flying Displays. 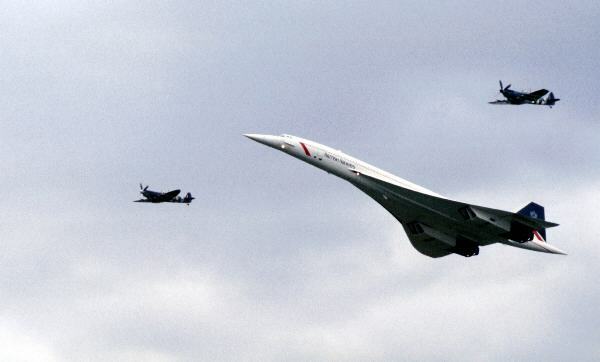 This particular picture was taken because it was a special flight on which my mother and sister travelled but, I am led to believe, they had drunk so much champagne by the time they reached Biggin Hill that the crowd's frantic waving (and the rest of the flight) went quite unnoticed! It is also home to other activities some details of which you can find here. The one, generally forgotton alternative to all this, is the newish airport in the former Royal Docks and which is only about eight miles away by crow (or plane) but it could easily take as long as getting to Gatwick during busy times i.e. outside 3 a.m. on Sunday morning. However, about 130 flights a day use the airport Monday to Friday serving various European cities so it might be worth trying London City Airport to find out more! Incidentally, don't be confused if you still see a 119 bus chugging down the High Street showing a destination of "Croydon Airport". There haven't been any planes from there for 50 years or so but, clearly, it takes time for the news to filter through! After reading all this, probably you are asking, how do I get to live here? First, you might like to check up on house prices, schools, crime, health etc. One way to do this is to go to Up My Street , enter a postcode (try BR1 if you don't know one) and all will be revealed! Having done that you could try one of the listed on local agents. Or you could go to Homes On-Line although they don't seem to have a lot to offer in this area. The other alternative is to stay in an hotel. 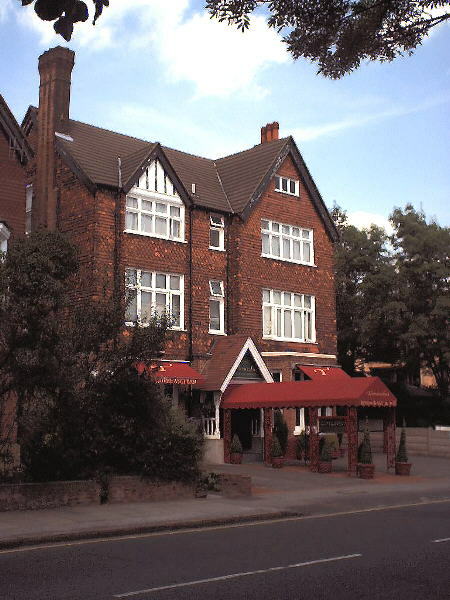 The only big hotel left in Bromley is the Bromley Court, situated about a half a mile north of the town centre on the A21 to Catford and Lewisham. It has several rooms for hire, a pleasant restaurant and a quiet garden, but it's quite expensive to stay there. An alternative is the Glendevon House although I've never tried it. If you are looking to stay a bit longer, then you could try Vacation Rentals who are offering a house which can't be far from here although I don't recognise it. Or, a little out of the area, but still in Bromley (just) is Melrose House which is quite handy for Crystal Palace park. Or why not try that great British tradition, Bed and Breakfast! Even if you don't find a hotel, you won't need to starve in Bromley. For example, near where I live is the Tamasha Indian restaurant in Widmore Road - the food is very good. It also advertises hotel facilities, but again I've never had to use them! An unusual restaurant is Caligvlette (sic) (Picture) in the High Street, just north of the Market Square. Good food, fresh coffee and a decor and atmosphere you don't come accross very often! There are of course the usual Macdonalds, Burger King, KFC and Pizza this and that, and there is Chinese, French, Greek, Indian, Italian, Malay, Portugese, Sicilian, Spanish, Thai and Turkish and even the occasional place serving English food as well. If eating meat isn't your scene, try the Bromley Vegetarians site. 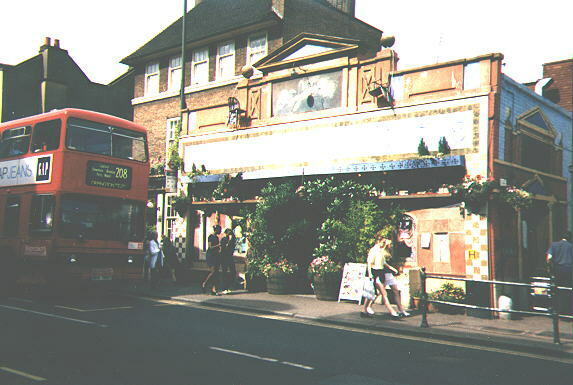 For some reason, Bromley was also chosen as the location for the cafe which featured in the Spam sketch in Monty Python - mention of Bromly only comes near the end! 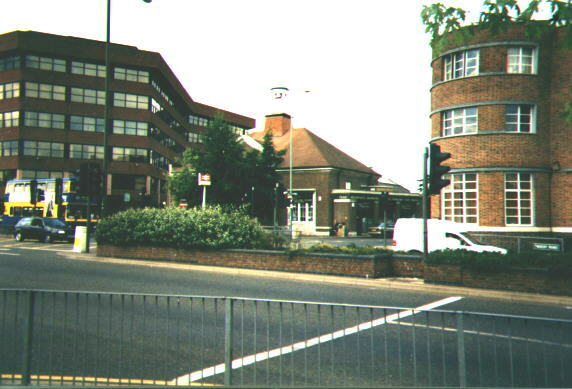 I suppose, since the Internet got going in the educational field, it is not suprising that they have many links on the Web although my old school, Bromley Grammar as it then was (now The Ravensbourne School) doesn't seem to have an active site, you can see a bit about it here. And yes, another picture with me in it! Actually Form RB outside the "temporary" huts in 1959. Where are Mr Gomm and everyone else now, I wonder? Well I could check Friends Reunited to find out! At least they've finally replaced the huts and made quite a good job of matching the original building style. However, I was interested to see the the large sign that used to be on the huts has been moved round the back by the science block. The sign? Allegedly the school motto, "Dead Slow"! 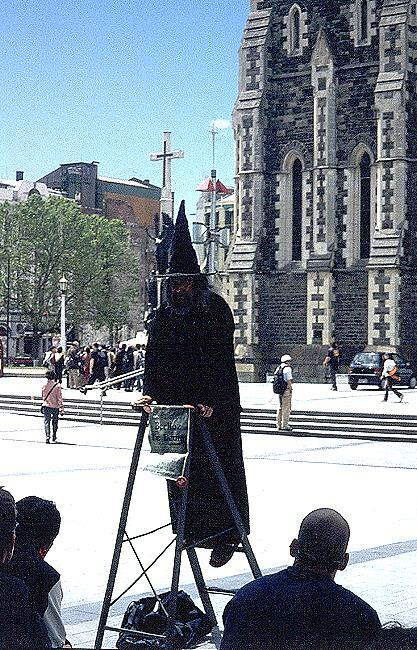 Just to prove that not all BGS old boys grow up to become sober citizens like me, check out the Wizard of New Zealand. Clearly living in such a remote spot is more stressful than I thought! 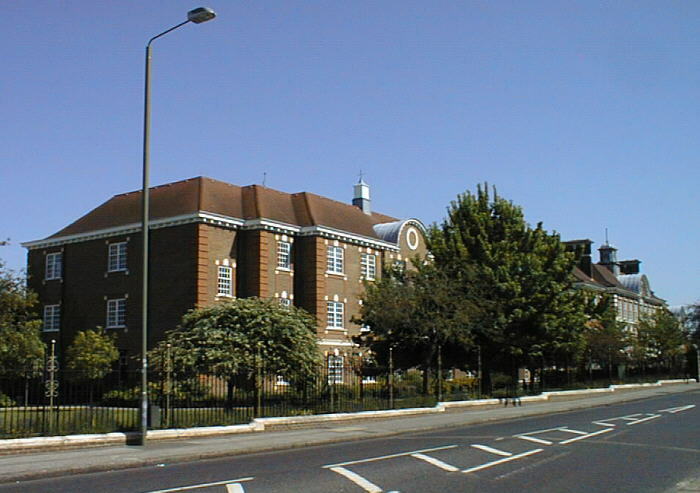 I also attended Bromley College of Further and Higher Education in Rookery Lane although when I went there it was just plain old Bromley Technical College. Information about Bromley schools can be found from this schools index (if you don't know the postcode, try BR11NA to start) but some schools have their own websites, including Langley Park School for Girls and an attractive site run by Kelsey Park School in Beckenham where pretty well everyone seems to be on-line! Also contactable is the Girls High School which used to be next to Bromley South station but moved out of town, no doubt most profitably! For the high achiever, or those with potential, there is the grandly named Sundridge Park Corporate Conference Centre adjacent to the golf course and a very nice spot to be incorporated (but it has just been sold again so I am not sure who you book with now)! However, if English as she is spoke is not your first language, then you could try Bromley Language Centre in the High Street. To refresh the soul, there is (or was) St.Marys which I attended for some years or for the non-conformist Hayes Lane Baptist Church, near my old school, or the less mainstream Bromley Town Church. After school, there is still the Scouts. Alternatively, you could join the 3rd Bromley Boys' Brigade. For ladies with a taste for the sea, the Association of Wrens meets monthly at the Parish Church and welcomes new members - give Marion a ring on 020 8300 2742 for more details. A little way out of town are the Bromley Bee Keepers. Perhaps that would give you a buzz! Maybe you should call on Bromley Friends of the Earth; aren't we all? Well perhaps not if you drive a car. Bromley is/has been the venue for an annual Pageant of Motoring, sponsored by Kelsey Publishing in Cudham. If you can't put off your journey until you pass your test, you can hire a car from Alimos of Bromley. Alternatively, you could try a big local firm, Cannon Cars who claim to meet your every need (travel wise anyway). Rather less luxurious transport can be viewed at the Bromley Bike shop or, if you don't actually want to go anywhere, then there is the Beckenham and West Wickham Model Railway Club. Another hobby which I still enjoy (I got rid of my model railway some years ago) is photography and the long-established Bromley Camera Club can be found here. For the more athletic, and not easily embarrassed, why not try The Ravensbourne Morris Men who meet in Keston Village Hall every Tuesday evening. Give Philip King the Bagman (?) a call on 020 8402 0528 or e-mail the Bagman. direct for further information. If you prefer singing to jumping about, why not try some barber shop choruses? However, if close harmony quartets aren't your scene, you could try the Bromley Concert Band, the Bromley Symphony Orchestra and the Bromley Operatic Society. For those with acting talent, real or imaginery, you can join the Little Theatre, a longstanding private establishment. If you are a bit shy about performing in public, then Speakers of Bromley could well give your confidence a boost! Of course, filling in your spare time doesn't have to be fun, why not get involved with the Waldo Road Waste Tip which when it is not closed by fire results in enormous queues (even for Bromley) on the adjacent main road. Finally, if you actually need to earn some money, try a local agency for a job.